In just a matter of hours your company can learn cardiopulmonary resuscitation (CPR), a life-saving technique that is easy to learn. 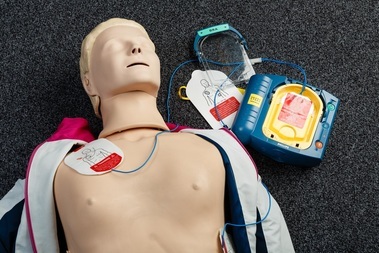 This course includes training with an automated external defibrillator (AED)-Philips HS1, CPR dramatically increases the chances of survival from heart attacks. Knowing CPR is a vital link in saving lives for casualities of sudden cardiac arrest, drowning, or choking until full care can be provided in a hospital. Course certificate for each participant upon completion of course.. Course size: 10-12 participants per course. Courses for fewer than 10 or larger than 12 are available. Contact Visida for details and information. ​Price: 6000 SEK per course. Maxium of 12 participants. Visida can come to workplaces to perform the course. Please contact us for more information about this. Visida uses Laerdal training manequins. Our instructors are certified by the Swedish heart foundation och speak fluent English. Courses may be held at worksites, or at Visida conference facilities in Luleå or Boden. There is no extra charge for courses held at Visida facilities.